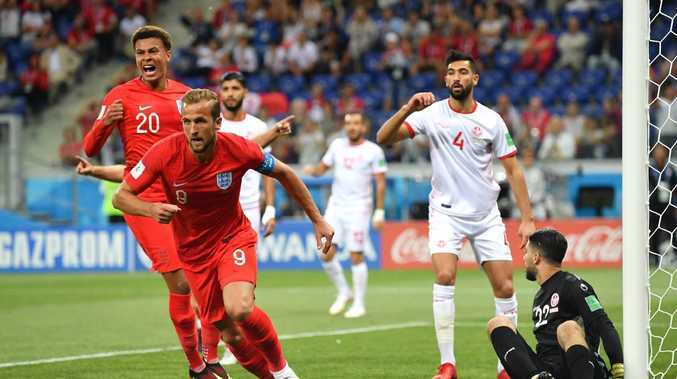 CAPTAIN Harry Kane came to the rescue with two goals, the second a dramatic injury-time winner, as England began their World Cup Group G campaign with a stuttering 2-1 win over Tunisia. Gareth Southgate's men almost paid a heavy price for missing a slew of first-half chances when Tunisia's Ferjani Sassi slotted home a softly-awarded penalty 20 minutes before half-time. And the north Africans were still level as the game went past the 90-minute mark. But Harry Maguire won a header from a corner and Kane was on hand at the far post to nod in the winner before being mobbed by his ecstatic teammates. England had started brightly in a blur of passing and movement and could have been two goals up inside the first four minutes. First Jordan Henderson's lofted first-time pass released Dele Alli and when the ball eventually broke to Jesse Lingard he saw his shot from six yards saved by the outstretched left boot of Mouez Hassen in the Tunisia goal. Jordan Pickford couldn’t stop Tunisia equalising in the 35th minute. Kane had been kept quiet in the opening salvos but he exploded into action in the 11th minute when he cut inside from the left and saw his shot from the edge of the box deflected wide for a corner. Ashley Young delivered the set piece for John Stones to rise highest and meet with a powerful header. Hassen saved acrobatically but Kane was on hand to tap home the rebound with his right foot and open his World Cup account. Hassen, who had injured his left shoulder making an earlier save, could not continue and left the field in tears as he was replaced in goal by Farouk Ben Mustapha. England continued to press and were made to pay for not converting a succession of chances when they conceded a soft penalty. Kyle Walker swung a lazy arm across Fakhreddine Ben Youssef who fell as if poleaxed and Colombian referee Wilmar Roldan pointed to the spot, with his decision being upheld by the VAR. 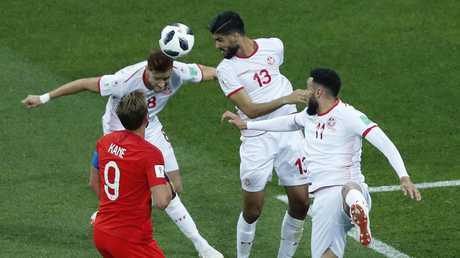 Ferjani Sassi took one step and fired home confidently past the hitherto unemployed Jordan Pickford and Tunisia who had been outplayed for the first half-hour were somehow level 10 minutes before half-time. Still there was time for Lingard to come close again twice, first from a goalbound shot and then a dink over the keeper which agonisingly struck the post. Alli too hit the woodwork with a header and England went into half-time wondering how they had not sealed victory already. England still enjoyed the lion's share of possession but could not find the same zip and penetration they had enjoyed at the start of the first half. The ineffective Sterling gave way to Marcus Rashford with just over 20 minutes to go and the Manchester United man almost fashioned a chance straight away with a jinking run into the box.